There are times after a passenger gets off of their flight at Las Vegas McCarran International Airport and need to get an idea of the airport layout to get to their destination so using our maps may help you get there better. Many call it sin city, but few can say they left without a great story. Whether you’re traveling for a bachelorette party or a business conference, the party starts as soon as you arrive to McCarran International Airport. With eccentric services alongside professional amenities, the airport is a goldmine of tourist attractions, making it the perfect place to hang out for a couple hours and wind down. 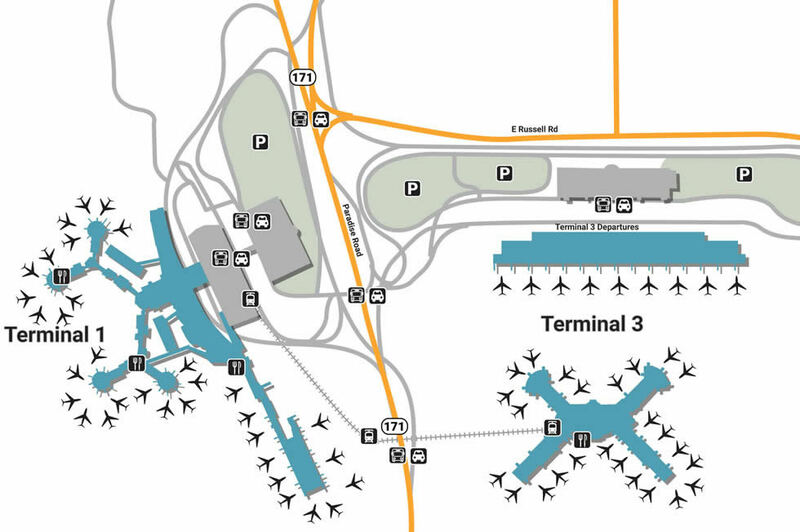 There are two main parking garages; one located by Terminal 1, which mostly hosts long-term parking with the exception of Level 2, and another located by Terminal 3, which offers short-term parking on level 1 while the rest is reserved for long-term customers. For drivers looking to do a quick pick-up, leave your vehicle at the Cell Phone Lot, free of charge for up to three hours. Make getting in and out even easier by utilizing the Express Exit when you take a yellow Express Ticket as soon as you enter the parking garage. Let the amusements and helpful hands of McCarran International guide you through difficult times. If you lost something, help is just a click away – go to the airport’s Lost & Found to submit a report, and be sure to describe in detail what you lost. The facility also makes things easier through technology in the form of mobile check-ins, the fastest and most convenient way to get to your flight without having to talk to anyone. There’s also an on-site aviation museum that explores southern Nevada’s pivotal role in the flight history. Kill some unwanted time by doing a little shopping. Show someone they’re loved by getting a brimming bouquet from 24-hour Flower, located at Terminal 1 Baggage. If you’re in need of something sweet, rejuvenate yourself with colorful candy at The Candy Shoppe located at Terminal 1’s Gate A & B. In addition to simple pleasures are a variety of opulent luxuries like Ethel M. Chocolates, located throughout Terminal 1 as well as Gates E and D in Terminal 3. While you’re at Terminal 3, eye the bright bags at the COACH store, offering the season’s latest textures and fashions. Offer up something special by eating somewhere special while you wait for your flight. A great local joint to try out is Baja Fresh Express, a famous Mexican grill located in Terminal 3. For a rodeo-style hamburger, head to Burke in the Box, located in the same area, and enjoy classic American grub for a low price. One shouldn’t forget, however, that they’re in Vegas – take a shot at Jose Cuervo Tequileria (Terminal 1, Gate C), a premium Tequila bar that offers exclusive Jose Cuervo flavors you can’t find anywhere else.